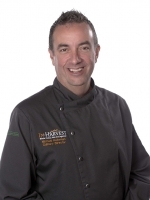 Michael Holleman, Director of Culinary Development & Marketing, InHarvest, Inc. Chef Michael began his culinary career in independent restaurants, where his interest in specialty and heirloom ingredients was born. As director of both InHarvest's Culinary and Marketing Teams, he is chiefly responsible for shaping the development of new products and working closely with his team to introduce new customers to the company's core products. He's the primary image-builder with all industries and segments InHarvest serves, working closely with growers, suppliers, brokers, distributors, manufacturers, foodservice operators and chefs to deliver meaningful food solutions. Based at InHarvest's headquarters in northern Minnesota, Chef Michael travels both nationally and internationally, giving presentations and cooking demonstrations on whole-grain trends and innovative applications, heirloom cultivation and sustainability. A member of the International Foodservice Editorial Council (IFEC) and Research Chefs Association (RCA), Chef Michael is the current chair of the culinary advisors to the Whole Grains Council, part of Boston-based Oldways. Additionally, he is the 2012 recipient of the RCA's Lifetime Achievement Award and serves on IFEC's board of directors through 2019.